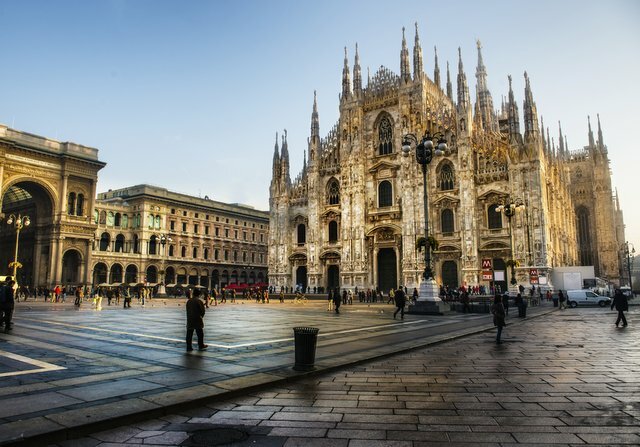 Exude style, elegance and glamour as you soar in to Milan’s metropolis on your private jet charter. Feel like royalty as you touch down at Milan Linate airport, looking the epitome of sleek and chic. With your best foot forward, get ready to experience the global capital of fashion and design. Milan has one of the most alluring of cuisines in the world, so you can expect to eat well wherever you go. It is home to some of the most innovative restaurants, where the exclusivity of the meal is akin to its own vacation. Allow your taste buds to indulge in Chef Carlo Cracco’s cuisine; his classic Milanese dishes with a twist will leave you hankering for more. Expect to see some famous faces in amongst the elite clientele that Cracco’s attracts. Before you have navigated around the exotic flavours and been stunned by the luxury of Chef Cracco, you must delve in to the realm of shopping. Milan is world famous for it’s innovation within fashion and design; it has housed designers such as Prada, Armani and Versace. Just a twenty-minute drive from Craccos, is the ultra glamorous Via Della Spiga. By far one of the most prestigious shopping streets in Milan. Forming one boundary of the Quadrilattero Della Moda, or ‘fashion quadrilateral’, Via Della Spiga provides you with an elite shopping experience, and holds prominent names such as Hermes and Bulgari. Even if you are not a fashion connoisseur, or hugely enthusiastic about what shops this beautiful street has to offer, it is nonetheless a fantastic, must-see spot for any keen tourist. Wandering through the cobbled streets, you are faced with raw extravagance that glows behind a façade of rather unassuming, yet simplistically gorgeous, architecture. Now, you have satisfied your culinary palette with the most sumptuous of dishes, it is time to satiate your cultural curiosities. Alive and brimming with exciting art and history, Milan is rich with antiquity and artistic expression. The Duomo di Milano (Milan Cathedral), located at Piazza del Duomo, is an amazing piece of Gothic architectural splendour, which took almost six centuries to complete! As one of the world’s largest churches, its exact central location is not the only thing that draws the eye. Its exquisitely sculpted statues, and exceptional spires, coupled with the stunning white façade, really takes your breath away. The Duomo is the central hub of tourism, and after you have admired the gorgeous exterior, you will be enthralled and want to see more. Luckily, to go inside this cavernous delight of the utmost brilliance is free, so you can wander around to your heart’s desire. Most people are aware of the ease of access into the Duomo. There are, however, fewer who know that you can survey Milan’s beauty from the Duomo roof! If you’re on a time limit, but want to admire some real Milanese views, head up to the roof and spend an hour revelling in the impressiveness before you. If the spires seemed magnificent before, they will be overwhelmingly impressive when they’re within reach. At the very pinnacle, after you’ve walked up the last couple of flights of stairs, you can more closely inspect the city’s symbol – the golden Madonna, who perches atop the tallest spire. During Milan Fashion Week, there will be countless numbers of chic, elegant and glamorous people all through the streets of Milan. Last Fashion Week, gorgeous women such as Frieda Pinto, Salma Hayek and Alexa Chung, were just some of the many celebrities to be found enjoying the sights, sounds and tastes of this fabulous city.